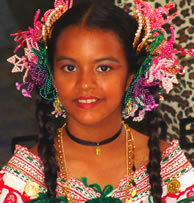 Panamanians are immigrants from the small Central American nation of Panama and make up one of the smaller groups of Hispanics in the North America. More than other Hispanic groups, a significant percentage of Panamanians are black, with the remaining being Mestizo, or of mixed race, which is the largest ethnic group in Panama. Although most Panamanians speak Spanish, they sometimes identify more with English speaking West Indian groups rather than with other Hispanic groups. The culture and customs are predominantly a mixture of Caribbean and Spanish elements. Many Panamanians have settled in large cities in North America. The predominant religion of Panamanians is Roman Catholicism. That existing evangelical churches will recognize that Panamanians are in need of hearing a message of grace through Jesus Christ. That evangelical Spanish speakers in North America will intentionally engage Panamanians with the gospel message.